Only a few works of art remain which date back to the construction of the Felsenkirche (1482-1484). We know, for example, that there once stood three Altars: a main altar, an altar to Mary, and an altar to Wolfgang). Today the church possesses only one altar­piece from the Middle Ages. Its late medieval glass windows were destroyed after being damaged repeatedly by rocks falling from the Bosselstein. And Wilhelm Heilig’s “unfortun­ate” restoration of 1927-1928 furthered the destruction of the interior’s media atmosphere. Fortunately some interesting objects remain. 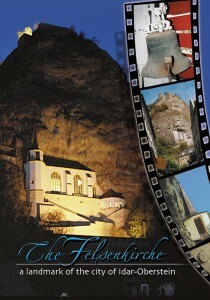 Our brochure “The Felsenkirche – A landmark of the city of Idar-Oberstein” contains extensive valuable information about the history of the Felsenkirche, its interior and numerous works of art that date back to the construction of the church. The brochure can be purchased at the Felsenkirche.